The best bioactive natural compounds to fight Pancreatic cancer? Can anything effectively fight Pancreatic cancer, one of the most aggressive cancers of the Western World? “Pancreatic cancer has a poor survival rate primarily due to late diagnosis, rapid disease progression, a high rate of metastases and poor record of conventional therapy success. The high presence of cancer stem cell subtypes makes current drugs almost useless. This has prompted scientists to look for natural bioactive compounds that can have an effect against cancer stem cells and to look for effects in different research methodologies (in vitro, in mouse and rat models and in existing populations) that might give hope for alternative treatments in Pancreatic cancer”, writes Chris Woollams, former Oxford University Biochemist and a founder of CANCERactive. Here we look at what we think are the best bioactive natural compounds with the potential to fight pancreatic cancer, in no particular order. You could add these to your personal plan today! 1. Ginger - particularly two of the bioactive constituents gingerol and shagaol - has been shown to have potent anti-cancer effects against several subtypes of pancreatic cancer cell lines. The ginger components create Reactive Oxygen Species (ROS) and these kill the cancer cells. 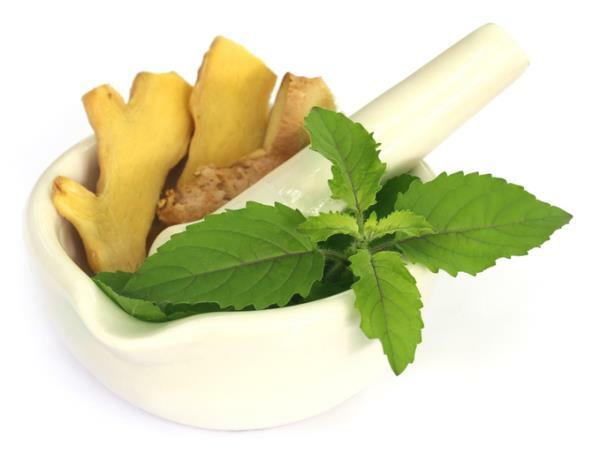 Ginger has been shown to be more potent than the drug Taxol against cancer cells. It should not be underestimated. 2. Dandelion Root Extract - Researchers in Canada have systematically studied Dandelion Root Extract against a number of different cancer cell lines. There is clear research showing it can kill pancreatic cancer cells. Go to: Can Dandelion Root Extract fight cancer? 3. Feverfew – A potent herb fast tracked against Leukaemia and Lymphoma already. The potent constituent is parthenolide, which has been shown to be effective in killing pancreatic cancer cells by attacking Nuclear Factor Kappa-B. In particular, parthenolide is known to be effective against cancer stem cells. 4. Holy Basil is an important Ayurvedic Herb with a number of proven and potent anti-cancer constituents like Apigenin and Ursolic acid. Holy Basil in the leaf extract form has been shown in research to kill pancreatic cells both in vitro and in vivo. In experiments with mice given pancreatic cancer there was a notable reduction in tumour size. Research also showed it stopped new metastases. 5. Black Cumin Seed oil - One potent constituent of Black Cumin Seed oil (Nigella sativa) is Thymoquinone which is proven to block pancreatic cell growth and enhance programmed cell death according to researchers at the Kimmel Cancer at Thomas Jefferson Cancer Center in Philadelphia. 6. Chinese Herbal Medicine (CHM) could also be a possible answer. People with pancreatic cancer who used CHM survived significantly longer than those who did not according to research from Taiwan. In the real life study, the most common single beneficial herb was Bai-hua-she-she-cao (Herba Oldenlandiae; Hedyotis diffusa Spreng) while the most successful Chinese herbal formula taken was Xiang-sha-liu-jun-zi-tang (Costus and Chinese Ammonia in combination). 7. Thunder God Vine (Terpterygium welfare) is another important herb in the Traditional Chinese Herbal Medicine armoury. One active constituent is triptolide which has been shown by researchers at the University of Minnesota to turn off a protein dubbed GRP78. This protein is normally responsible for stopping cells dying. It is found in very high levels in pancreatic cancer and triptolide stops its protective action. 8. Yams are a part of a plant family called Dioscoreaceae and commonly contain Methyl Proxtodioscin, or MPD. This compound has many health properties. For example in research it has been shown to be lipid-lowering, anti-inflammatory and have anti-cancer properties. The National Cancer Institute has confirmed three anti-cancer properties - cytoxic activity, cancer cell cycle arrest and apoptosis. 2018 research has shown that injections into mice with pancreatic cancer greatly reduced glycolysis (the energy production system of cancer), reducing proliferation and promoting cancer cell death. It is quite possible this would work on other cancers too. "If you are already thinking of supplementing with any of the above products, why not take a look at Our Natural Selection by clicking here."